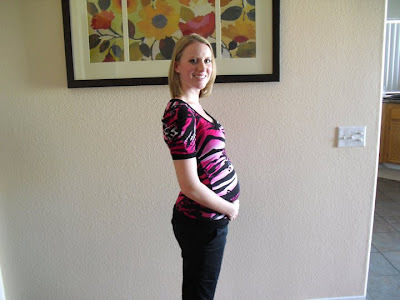 For my 30 week pregnancy post I thought it would be fun to take a look at some of the belly pictures I've taken through the pregnancy so as to be able to compare better! 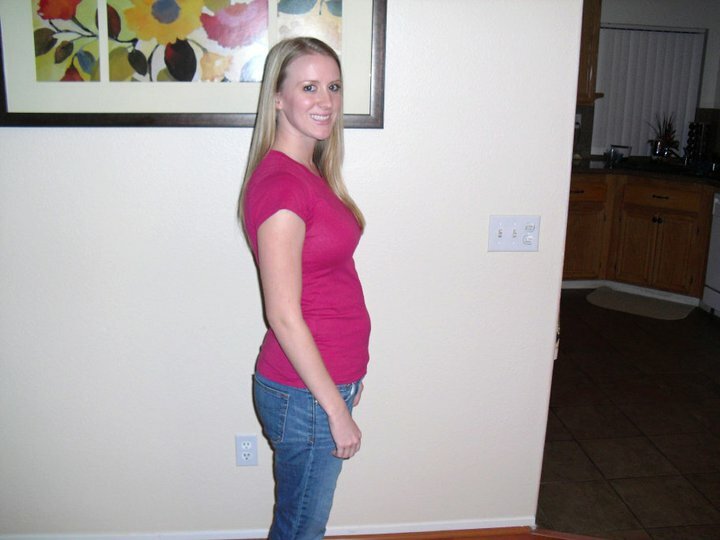 12 weeks- I remember thinking I had a baby bump here. Now I'm pretty sure it was just bloating. 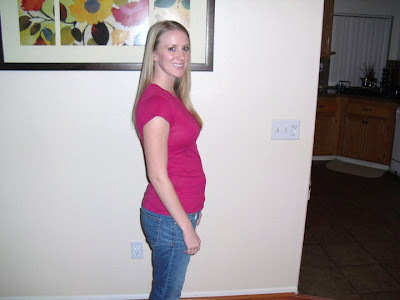 Even with bloat, I was skinny!! 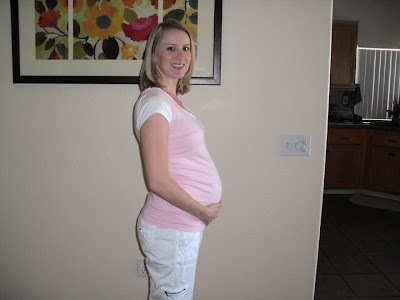 20 weeks- The week we found out we were having a girl! 25 weeks- Well on my way! Definitely wearing maternity bottoms at this point. 27 weeks- The beginning of my "screw blow drying- pony tail it is!" stage. Also only wearing maternity tops by this time. 30 weeks- My belly has dropped and rounded out some more by this week. It doesn't look too much bigger to me, just different. I'm in the home stretch now. Only 10 weeks left to go! I'm getting pretty dang uncomfortable. It hurts to get up out of bed, off the couch, or to walk and stand for too long. It also hurts to sit sometimes. Basically my body just hurts a lot of the time. I have an appointment with a chiropractor next week who specializes in aligning pregnant women. They say it's a good idea to get aligned before labor even if you aren't in pain. I've never been to a chiropractor before, but if he can help me then I am willing to try it! I also might do a prenatal massage sometime soon. That sounds heavenly to me! The chiropractor works with someone who does massages as well so I think I might just sign myself up for that when I go in. Other than aches and pains that any pregnant woman has, I am doing pretty well! The heat is miserable but I manage to stay cool enough inside. My birthday is coming up soon (the 21st) and so is my baby shower (Aug. 6th) so it's nice to have something to look forward to that's even sooner than having the baby! One last thing I'd like to make note of is that I bought Jewel's Lullaby CD at Target and I'm in love. I always liked Jewel and listening to her sing lullaby songs is just so sweet and makes me even more excited to have this baby girl. I imagine holding my baby while singing along to this CD. This is my first baby CD and I think I will need to buy some more! You're almost there, girl! You look great! I love the pics! I can't believe you're almost at the end of your pregnancy!!! You look amazing!! And I can't believe you're already 30 weeks. It seems like yesterday you announced you were expecting. Only 10 weeks to go...so crazy! You are so presh friend! Love you! OMG, I love the chiropractor! It makes your stand up straight, release tension, ahhhhh....enjoy! You're looking beautiful! And you'll be holding your baby in your arms in no time! I've heard great things about the lullaby cd. You look great!